This summer salad is an excelling pot luck dish, barbeque side or even just something to have around for lunches and dinners. 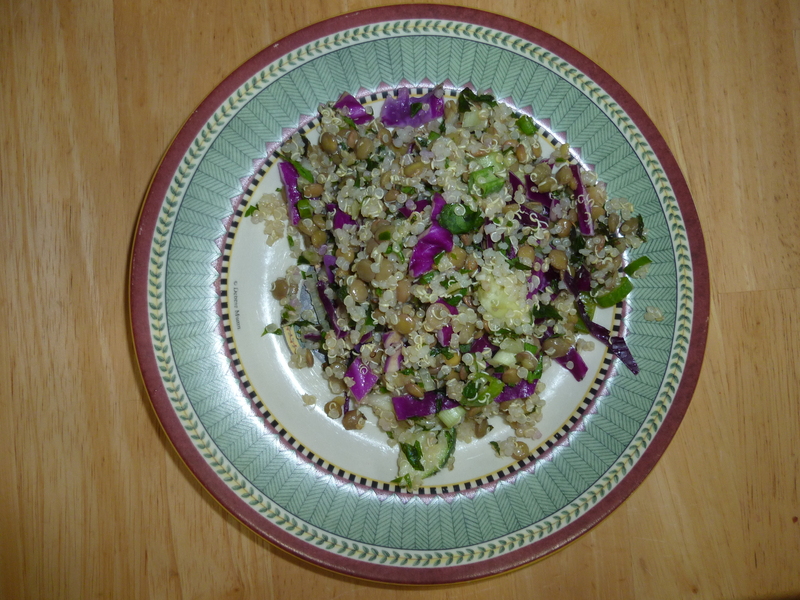 It is adapted from a lentil-bulgur salad recipe from the Moosewood Cookbook. I make ours with quinoa because we don’t usually have bulgur lying around, but we always have quinoa on hand! Also, as you will see in the notes, this salad can be adjusted to use whatever veggies you have lying around. While it is delicious with bell pepper and red onion (as the recipe suggests) I have made it will scallions and cabbage, and it still was yummy and refreshing! 1) Place the lentils in a medium-sized saucepan, cover with 2 cups of water, and bring just to the boiling point. Turn the heat way down, partially cover and allow to simmer without agitation for 20 to 25 minutes or until tender, but not mushy. Drain and transfer to a large bowl. 3) Add everything else to the bowl with lentils and quinoa. Mix gently but throughly. Cover tightly and refrigerate. *As suggested, feel free to play around with the veggies. I have replaced the bell pepper with carrots, or cabbage, or even extra cucumber.